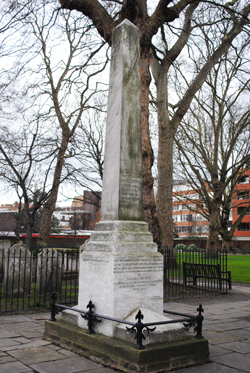 Located in Bunhill Fields Burial Ground in City Road, this memorial to Daniel Defoe, the author of numerous books including Robinson Crusoe and Moll Flanders as well as a journalist, pamphleteer and ‘provocateur’ or spy, wasn’t erected until 1870, almost 140 years after his death. After he died in 1731 at the age of 70, Defoe was among the more than 120,000 people buried in Bunhill Fields, a Nonconformist cemetery which opened in 1665 and had closed by 1853. He was apparently buried under the name Dabow, thanks to a spelling mistake made by the gravedigger. When he died in relative obscurity (he was believed to have been hiding from his creditors at the time), his fame rose after his death – due in large part to the rising popularity of Robinson Crusoe, and by the mid-19th century, it was believed that the simple headstone over his grave didn’t do justice to him. Hence an appeal was run by children’s magazine Christian World for a more suitable memorial for the writer – named as Daniel De-Foe on the memorial – and more than £150 was raised from 1,700 people, an amount which apparently exceeded expectations. Sculptor Samuel Horner was subsequently commissioned to carve the memorial obelisk, which features projections at the base resembling a coffin lid, to the designs of CC Creeke of Bournemouth. It was unveiled on 16th September, 1870, in a ceremony attended by three of Defoe’s great grand-daughters. There was apparently a newspaper story that the sculptor uncovered a coffin bearing Defoe’s name in preparing the site for the monument and had to get the aid of police to prevent watchers from making off with the bones from within. The monument, which may not mark the exact location of Defoe’s grave site due to the movement of graves in the burial ground, is now Grade II*-listed (and the burial ground itself Grade I-listed). Others buried at Bunhill Fields include author John Bunyan, artist William Blake and Susanna Wesley, mother of John Wesley, founder of Methodism. Thank you for the post. If you interest in more on John Wesley please visit the website for the book series which features the work of John Wesley. The Asbury Triptych Series opens with the book, Black Country, detailing the early Methodist movement in London, Bristol and several other major cities in 18th-century England. Black Country also features the ministry of a young preacher from the West Midlands, Francis Asbury. The website for the series is http://www.francisasburytriptych.com. Again, thank you for the article.